How to Publish a HOTLINK in a BLOG. 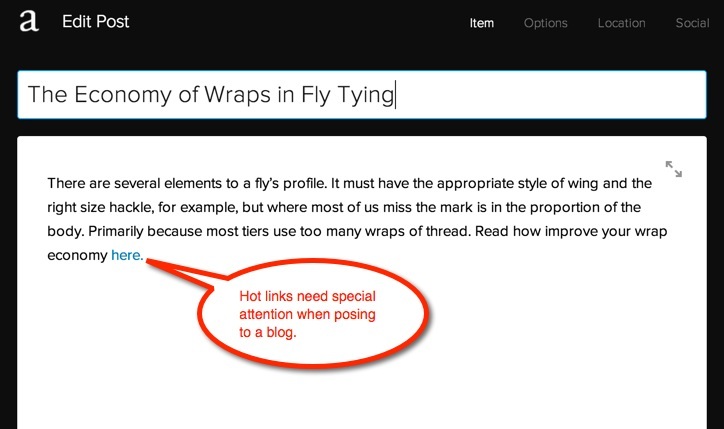 HOTLINKS are useful bits of code in a BLOG post that will open up another web page when they are clicked. IF THE HOTLINK POINTS TO A WEB PAGE THAT IS NOT ON OUR CLUB SITE, IT IS VERY IMPORTANT TO MAKE SURE THE OPEN A NEW WINDOW BOX IS CHECKED BEFORE PUBLISHING. (If this little step is not done it will send the user away from our club site with not good way to return. If done properly clicking the link will simply open a new window and leave the club web page still open making, it easy for the user to return to our web site). There are easy instructions below. Check your work by high lighting the hotlink in your BLOG post. You will see two pop-up windows open. Click where you see the word EDIT in the lower window and a new pop-up window will appear. From here you may check the hotlink URL. "Files" is for pointing to files already stored on the web site. And, "Content" is for pointing to other site web pages. "External" link type is for pointing to links outside the web site. IF YOUR LINK POINTS TO ANOTHER WEB SITE YOU SHOULD ALWAYS CHECK THE "Open link in new window" BOX. This prevents site users from accidentally leaving the site. When you publish your settings should look like it does below. New window box checked and comments turned OFF.